Shamanthakamani belongs to the former. The story is woven around one crime episode and ensuing events are narrated, ultimately unfolding the mystery behind the crime. Two genres are safe bets for small and medium budget films in Tollywood currently. For past 4-5 years, the trend is that these two genres namely ‘Crime Comedy’ and ‘Horror Comedy’ [ with a dose of action] have proven to fetch minimum guaranteed revenues. Films such as ‘Swamy Ra Ra ’ ,’ Kshanam’, ‘Shankarabharanam’ (new) and ‘Keshava’ belong to the Crime Comedy category. Whereas ‘Prema kadha chitram’, ‘Rajugari Gadhi’,’ ‘Ekkadaki Potavu Chinnavada’ and ’Karthikeya’ fall under Horror Comedy. Shamantakamani, an expensive Rolls Royce car worth Rs. 5 crore is stolen at a party. Krishna (Sudheer Babu) files a complaint with the police and CI Ranjith (Rohit) is assigned with the job of finding the missing car. In his investigation Ranjith finds three people as the prime suspects. 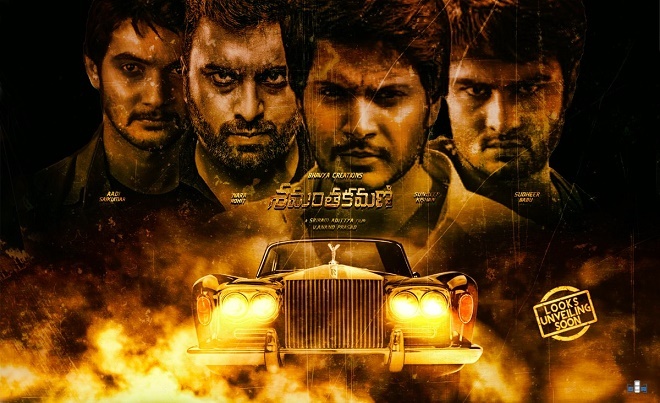 A jobless, uneducated youth Shiva (Sundeep Kishan), a carefree guy Karthik (Aadi) and a mechanic (Rajendra Prasad) all are somehow connected to the car, but claim innocent. How does Ranjith solve the crime and who is behind the car theft? A costly 5 Cr car Shamantakamani is stolen. Who stole the car and why, is what the film is all about? Four individuals named Krishna (Sudheer Babu), Shiva (Sundeep Kishan), Karthik ( Aadhi) and a Car mechanic ( Rajendra Prasad) attend a party at Provotel pub located in Hyderabad city. Sudheer Babu, after the party realises that his Rolls Royce vintage car valued 5-crore rupees is stolen from the parking lot. C.I. Ranjith (Nara Rohit) investigates the case, probes the suspected attendees of the party. 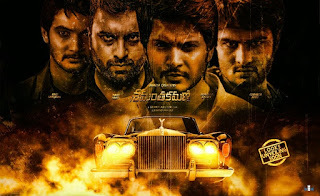 As the movie unfolds, Ranjith listens to each of the suspect’s (Sundeep Kishan, Aadhi and Rajendra Prasad ) version on what had happened that night. It is the Pre-climax and Climax that reveals the shocking facts and twists. The story in this genre is thin, so the writers and the director should be able to build strong situations and characterizations to make the film engaging. Especially when the film has multiple unrelated threads (characters) which concur at certain point in the story. Director’s strengths are reflected in how well he/she can infuse entertainment and characterization in the limited scenes for each thread. It is easy to grab people's attention with four actors playing the lead characters. But to write an engaging screenplay by giving equal importance to all the characters is not that easy. Sriram Adittya clearly struggled to come up with an engaging screenplay. He took so much time to introduce all the characters and establish a motive for them to take up crime. We cannot root for any of the characters including Sudheer's who has an emotional back story. Director takes his own sweet time to get to the point of crime. Car is stolen at the intermission point which is a perfect setting for engaging second half. Interrogation process seems interesting but none of the perspective stories of Rajendra Prasad, Sundeep and Aadi makes an impact after knowing them. Only point that hooks is the suspense about who has stolen the car. Final reveal is cliched sans logic, but the finishing to all the characters is entertaining. Except for the ending Shamanthakamani doesn't give a satisfactory feeling at any point of time. It is a very lame script with good setting and casting. Films like these have limited appeal and it will be hard to please the genre fans with such lackluster script. Nara Rohith is his usual self in the police character. He has done many cop characters in his career and is at ease as a corrupt police. Sudheer Babu's character is emotional and he is good. Sundeep Kishan did well and leaves a mark despite less screen time. Aadi is also fine as the frustrated lover. Rajendra Prasad and Suman are adequate in their roles. Indraja and Chandini are okay in their limited roles. The key strength of the film is in its cast and their performances. All youngsters did fine but Sundeep Kishan leads the pack in performance.His diction and ease in action is getting better with every movie. Sudheer Babu’s character demands portraying some sad moments which he handled well. Aadhi and Nara Rohith were fine and their roles are kind of fun oriented. Senior actors Rajendra Prasad and Suman were adequate. The two female actors Chandini Chowdary and Indraja had very limited scenes. They did decently for their part. Sriram Adittya's stylish taking makes it look like an expensive film despite the low budget. Director has good grip over technical elements but fails in writing an engaging script. Poorly written screenplay is its biggest drawback. Production values are pretty good as the film mostly runs in the night mode and the camera man showcased the proceedings in a rich light. Dialogues are fun and so was the background score by Mani Sharma. Editing is pretty decent as the crisp run time helps the proceedings big time. Coming to the director Sriram Aditya, he has chosen a simple story but wrote his characters well. He also scores for choosing noted heroes and this is where the film clicks as the presence of these stars makes the proceedings even more interesting. Direction wise, Samantakamani is a better film than Bhale Manchi Roju. Manisharma's soundtrack is ordinary but the background score is impressive. Cinematography is also impressive and editing stands out among the technical departments. Production values are decent. Even though Sundeep Kishan’s role was small, his experience and screen presence elevate the proceedings quite decently. Aadi does well in his role. Characters like these which suit his age and image will surely take him higher. One of the biggest plus points for the film is the interesting story line. Even though the point is old, the way the story has been set up amidst different characters is very impressive. All the heroes get equal parts in the film as director Sriram has etched out everyone’s role quite convincingly. If Rajendra Prasad’s role evokes good fun throughout, Sudheer Babu’s emotional quotient in his performance is good and one can connect to this role on a personal level. Comedian Raghu gets a meaty role and all his investigative and comedy scenes with Nara Rohit are decent. Rohit is pretty solid in his cop avatar and brings a depth to the film. The second half is where all the fun begins as the film is ended quite well with proper justification. Indraja and Rajendra Prasad’s track is well written. After starting the film on an interesting note, director Sriram Aditya goes into every character’s flashback and their stories. Not that it is bad, but they are a bit slow and take away the interest of the viewer to know what happened to the car. There was scope of much comedy in many areas but the director stuck to the plot and made it run on a flat note at some places. As nothing much happens during the first half, some commercial elements could have been easily added. Verdict: Shamanthakamani is a pretty mediocre Crime investigative film. If you are a fan of any of the four young heroes, you could watch it. Being a multi-starrer, the openings may be encouraging in domestic market. Overall, it could have been better. Music by Mani Sharma is mostly about background score and its terrific. The cinematography is good. Editing could have been sharper. Dialogues are superb.